Were these soldiers aware that the parade they passed had been possible because of them and their twenty six thousand brothers and sisters who perished and many of whose graves lie scattered all over the continent unsung and unacknowledged by an ungrateful nation? The contrast also couldn’t have been more stark. Many of the tableaus were around Gandhi, the man who threw Bose out as party president and realized that his ‘Quit India’ movement had been a total failure and it was actually the fear created by the INA that made the British to leave India and not his spinning wheel. In his tryst with destiny speech when India got her independence, Nehru did not mention the contribution of INA or about the countless revolutionaries who were hanged. He didn’t mention the Naval Revolt. He did not mention the twenty six thousand soldiers who sacrificed their lives in the war with British. Would it have ruined the ambiance of the occasion and upset the likes of Lord Mountbatten and others who would have found it distasteful to hear that the British were finally beaten? Nehru’s speech at midnight omitted out on the staggering cost that the soldiers and people of India paid to bring about freedom from the British. The added glorification of non-violence added a layer that put a lid on that truth. The Indian people were insulated from the horror that was the freedom struggle that the INA and the revolutionaries went through. To believe that a nation got their freedom and won against a power that was as brutal and violent as it could be may one day be seen as sheer grandiosity, delusional and a self destructive journey led by a leader rooted in narcissism. A last word for the man who made it possible for us. It must not have been not for him to change the wheels of history. A small change but giant in its impact is what I would call it. But the message through this and many similar acts he initiates is as clear as a blue sky. The clouds are moving away and we have a right to know our past, our history as it happened and not as one based on lies. To me that may herald the dawn of a new era. 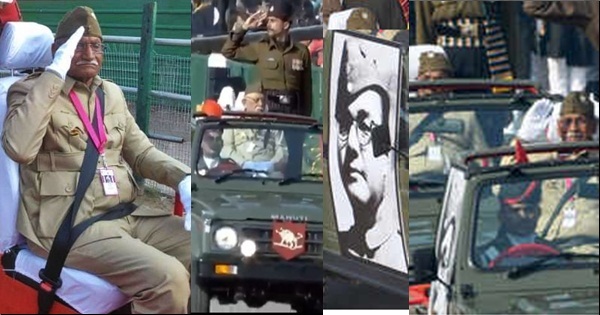 Honour INA and Netaji Bose; Let INA Veterans be Included in RD Parade: Maj Gen GD Bakshi Ajit Doval Assures Bringing Surviving INA Veterans to RD Parade: GD Bakshi If INA Veterans Not Included in RD Parade, I and Dr Swamy will Go to Court: GD Bakshi Surviving INA Veterans to be Honored Today by Dr. Swamy and GD Bakshi Empire Strikes Back: 22 Tableaux for Gandhi, Not One for Netaji in 70th RD Parade Is Nehru to Blame for India Not Securing Permanent Membership in United Nations?